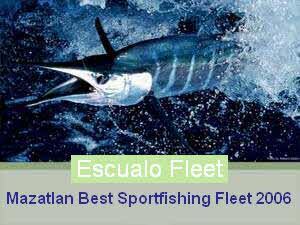 Out of the 9 species reserved for sportfishing worlwide 7 of them available in Mazatlan's saltwaters. The waters around Mazatlán provide some of the finest sport fishing in the world. The fishing is excellent all year for marlin and many other species. All charters should be reserved as far in advance as possible to insure availability of your requested boat type. We suggest a minimum of 2 weeks advance notice to confirm your charter boat reservation. Escualo Fleet. is the Official fleet for Hotel Playa Mazatlan, Pueblo Bonito, Emerald Bay, Torres Mazatlan, Mayan Sea Garden, Inn at Mazatlan. 26 Feet /Twin outboars (4 Strokes) Mercury 30 knots/ 4 to 6 passengers / Private bathroom. Description 36 Feet, Twin Diesel (Cummins) 25 knots, Cabin, private bathroom, up to 8 passengers. Two standard fight chairs. INCLUDED: All fishing equipment, billingual crew, passanger insurance, filleting and cleaning the fish, fishing tackle. Our Captains are very experienced, and will do their best to ensure your catch. Mazatlan is known worldwide for the excellent fishing. Mazatlan was born and became discoveres as tourist destination thanks to Marlin Sportfishing.Years of professional experience gives you the edge in bringing home the Big Ones. Live the adventure of a lifetime and a voyage you can't afford to miss. Catch the thrill of offshore fishing as you cast for the giants of the Mexican Pacific. Experience record-setting catches of marlin, sailfish, tuna and dorado from the waters off Mazatlan Mexico. While better deals are more likely out of Los Angeles or Houston, from Miami you'll likely spend $700-$800. A: The striped marlin is the most widely distributed of all Pacific billfishes, yet studies show that the genes of populations from separate parts of the ocean differ slightly from each other. A striped marlin from Mexico or Ecuador, for example, has DNA markers different from those of a striped marlin from Hawaii or New Zealand. On the other hand, as a species the striped marlin is almost identical genetically to the Atlantic white marlin. Genetic evidence suggests that striped marlin either stick very close to home or return to a home area each year to spawn; however, striped marlin are known to travel great distances. Although theoretically residents only of the Pacific and Indian oceans, some striped marlin do occasionally round the southern tip of Africa and are caught on the Atlantic side of the Cape of Good Hope. According to records, one stray individual was caught off Angola, West Africa.